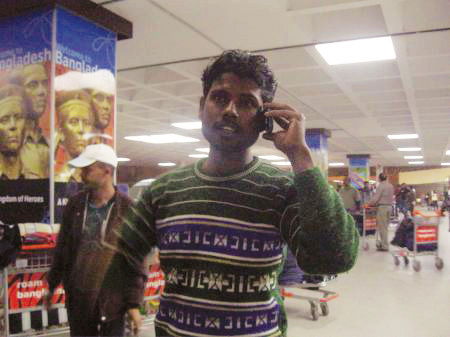 Caritas Bangladesh and its partner organisation OKUP are providing assistance to Bangladeshi migrant workers fleeing the social unrests in Libya on their arrival at Dhaka airport. Returnees are given some money, food and transport facilities to reach bus terminals or railway stations. While Caritas asked about his needs, 32-year-old construction worker Salim told them how he witnessed the fighting. “When I left the capital Tripoli the situation was very bad. I saw a lot of demonstrations and fighting. The protesters against Libyan President Qaddafi were carrying rifles and machine guns and the repression from the army was very tough. I saw people get beaten and we could hear shots. “I didn’t feel safe there anymore, the situation was very dangerous. As a foreigner, you had to be careful not to be drawn into the unrest. My mobile phone and some money were stolen, but apart from that, I was lucky nothing happened to me. “Luckily, I could get a flight home quite quickly. I had to deal with everything myself though, my embassy didn’t help me at all. And then it took me two days to come home because I had to change flights twice, first in Jordan and than in Qatar. So I am really, really tired now, but very happy to be with my family back in my home district Kishorgonj in the North-East of Bangladesh. “My wife saw the unrests on TV and was very worried about me. I could reassure her by calling whenever I could and telling her I was fine, but she is glad to have me back here now.